Serial Borgward BX7 2016-2017 model year — Photo & Video, price and configuration, technical specifications of the new crossover from China. The official premiere of the serial version of the Chinese crossover Borgvard BH7 planned under the Beijing Auto Show 2016 (Beijing Auto Show). With a pre-version news — Borgward BX7 Concept car enthusiasts met in the autumn of 2015, Germany’s Frankfurt Motor Show. 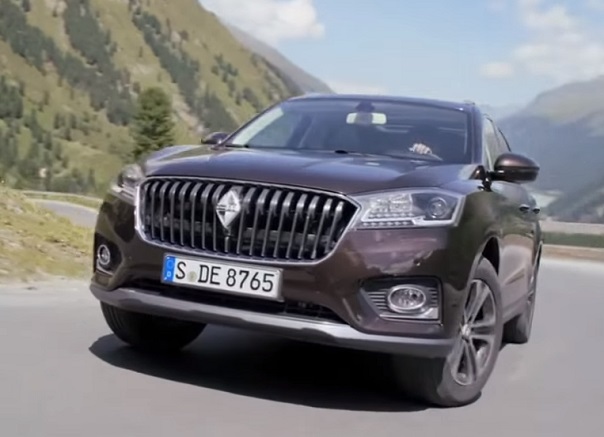 Home sales Borgward BX7 in China will be in the summer of 2016, according to preliminary data from the price of 35 thousand. Dollars. A brief excursion into history. The German car manufacturer Carl F. W. Borgward founded in 1929 by Karl Borgvardom engaged in the production of buses, cars and trucks. But in 1961, the company ceased to exist because of the bankruptcy. In 2008, the grandson of the company founder Christian Borgvard reconstituted company under a new name Borgward AG by means of financial support to the Chinese company of Foton, which is, in turn, a subsidiary of BAIC Group. So Borgward BX7 purely Chinese product, and in fact before us perelitsovanny, ennobled and improved crossover BAIC Senova X65 (pictured below). Exterior design of the new body Borgvard BH7 is a former chief designer of Saab Norwegian Einar Hareide. 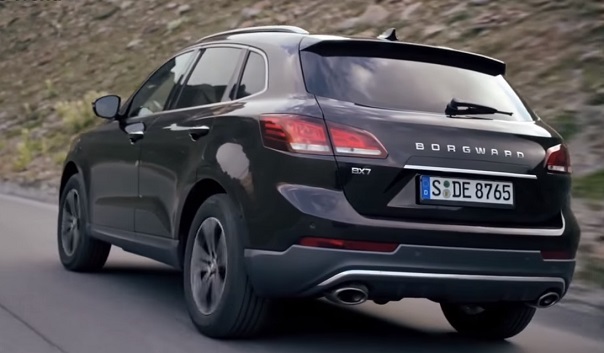 Interestingly, for the production of the brothers already prepared other models of crossovers from BAIC Borgward: Senova X55 altered in Borgward BX5, and Senova X35 facelift in Borgward BX3. The efforts of designers have created a new stylish image of the Chinese crossover labeling in the premium class, worthy of praise. The new SUV from China really looks modern, stylish, sporty and European. In short, solidly and respectable, without too much tinsel and garish. Above all, attention is drawn to the original false radiator grille with vertical slats, stylish headlights with lens optics and LED rays daytime running lights and turn indicators, smooth and harmonious lines of the body, an attractive design light-alloy wheels, harmonious feed crossover with neat marker lamps. 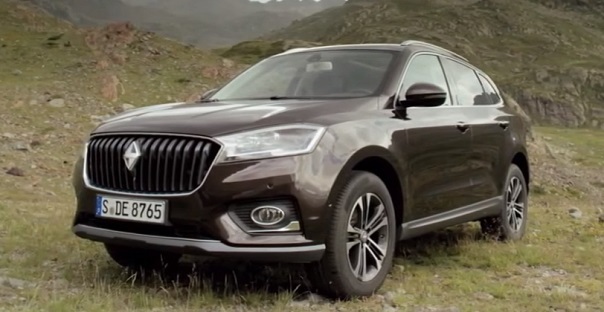 External dimensions of the new Chinese body crossover Borgward BX7 up to 4715 mm long, 1910 mm wide, 1690 mm in height, with a 2760 mm wheelbase of 190 mm and clearance. Depending on the trim level for the new items offered alloy 17-18 inch wheels with tires 235/65 R17 or 235/60 R18. With its external dimensions body Borgvard BH7 comparable with such crossovers as the Acura RDX, Audi Q5, BMW X3, Cadillac XT5, Dongfeng AX7, Hyundai Santa Fe, Kia Sorento, Mercedes-Benz GLC, Mitsubishi Outlander, Nissan X-Trail, Volvo XC60. So the three rows of seats can be installed in the cabin. New Borgward BX7 is offered in a large number of complete sets and versions that differ from each other not only filling options, but also the possibility to order 5, 6 and 7-seater interior configuration. Cargo space is able to take from the modest 126 liters of cargo volume behind the back of the third row and reasonable 545 liters behind the back of the second row, the maximum possible amount to 1377 liters of luggage compartment in the five-seat version of the SUV and 1277 liters in seven-seat variant. Execution of a new crossover model of the interior of China BX7 from the revived company Borgward perhaps one of the best cars produced in China. Modern and stylish architecture of the front panel and center console, quality materials and accurate assembly, excellent ergonomics and a lot of advanced equipment. Already present in the standard control steering wheel height and depth, color screen of the onboard computer on the dashboard, 6-Th airbags, central locking with remote control and factory anti-theft system, ABS, EBD, EBA, BAS, ASR, ESP, Hill- start Assist, electric park brake button with a compact, light alloy wheels R17, multifunction steering wheel, parking sensors front and rear, upholstery leatherette, lift the driver’s seat, 12.3-inch color touch screen multimedia system (music, Bluetooth, USB + AUX ) audio system with 7-speakers Mew, air conditioning, electric side windows and door mirrors with heating. Specifications crossover Borgward BX7: since the beginning of sales of new product planning to equip the petrol four-cylinder 2.0-liter engine with turbocharging in two versions (201 HP and 300 Nm 224 Nm 300 bhp) paired exclusively with automatic transmission 6. Standard crossover with front-wheel drive as an option, available all-wheel drive. Suspension is fully independent with MacPherson struts in front and mnogoryichazhka rear disc brakes on a circle. In the near future under the hood crossover prescribe more powerful petrol V6, and will also appear and the hybrid version with 400-strong powerplant.